Nothing says “summer is here” more than the pok-pok of tennis balls hitting racquets, the clink of Pimms glasses and the gentle gloop of fresh cream poured on strawberries. 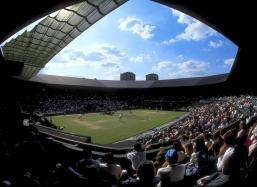 Our Final Weeekend, Court One, Wimbledon Tennis Championship package, for the All England Club in July 2018, are a great way to enjoy the event. Our Wimbledon Packages for 2018 are now sold out. 16:00 – 18:00 – Your representative will be at your hotel to help with check-in and any other assistance should you need it. The rest of the time is at your leisure: the hotel offers a mini-gym and a restaurant. It is within easy access of Legoland, Windsor Castle and Hampton Court if you want to add some sightseeing to your sporting package. After a hearty breakfast check out of the hotel and take your luggage to reception for safekeeping. After the day’s play your coach will take you back to the hotel to pick up your luggage and allow you to continue your journey home.